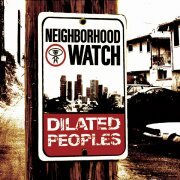 RapReviews.com Feature for April 6, 2004 - Dilated Peoples' "Neighborhood Watch"
That certainly seems apt. Ever since first blazing their way into hip-hop music on the "Work the Angles" twelve inch, Dilated Peoples have been expanding both the boundaries of the artform and the size of their audience. Their full length debut "The Platform" was as solid a statement as you could ask for from any new group, and by the time "Expansion Team" rolled around a year later they had simultaneously solidified their place and sound. With a strong push from the popular Okayplayer website Dilated seemed to be on a roll and gathering no moss - just more heads who felt that Evidence, Rakaa Iriscience and DJ Babu were the truth like 42 was the answer. Run-D.M.C. showed me how to walk, this way"
It's all for the love, but some pay the ultimate price"
Merriam-Webster: "A structure, configuration, or pattern of physical, biological, or psychological phenomena so integrated as to constitute a functional unit with properties not derivable by summation of its parts." But the police watch every breath I take"
Of course no Dilated album would be complete without a West coast all-star set and "Closed Session" features all the big names - Defari, Phil Da Agony and Planet Asia. No Dilated album would be complete without DJ Babu getting a solo chance to shine his turntablist skills, and the Premier tribute "DJ Babu in Deep Concentration" serves nicely. As the album's finale, it also makes a statement about Dilated Peoples dedication to the elements of hip-hop. You can find them all represented strongly on "Neighborhood Watch," which can be viewed as both them holding down their Cali turf and keeping an eye on the hip-hop collective to which they belong. Under their guidance, falsehood shall perish and whackness be banished. Long live the expanders.